The desire to contribute to something that is bigger than yourself is something that seems hardwired into the human psyche. For as long as history remembers, people have found humanitarian missions an incredible way to answer this need. It opens eyes and instills a deep sense of satisfaction as you make a contribution to a person, a family or a community in need. Yet when looking for opportunities to best serve, it can be easy think ‘What can I do?’ Who would I volunteer for anyway?’ It may surprise some to know that there are very specific ways that chiropractors can contribute abroad. Jennifer Luu was in her fifth year of chiropractic when she joined a chiropractic volunteer team to Cambodia as part of her placement. It was an experience that moved her deeply, prompting annual returns every year and leading her to establish ‘To Love and Serve.’ The latter is an organisation set up to recruit and help fund health care professionals onto volunteer medical teams working in disadvantaged communities in developing nations. So what does a day in the life of a Restore One Volunteer Trip look like? We jump into a clinic van and head off to one of the islands or villages off Phnom Penh or in rural Cambodia. [Restore One’s] mission is all about restoring one village at a time. So rather than spending bits of money on various different projects, they work on getting one village self sustaining and then move on from there. All the trips are so different. During a day we will jump out in the vans and head out into the villages and run a mobile chiropractic clinic. You’ll adjust from 8-4 and see as many people as you can in that day before the monsoon rains hit. But on another day you might be picking up a hammer and some nails and actually constructing a house for a homeless family that the village chief has nominated. It’s resulted in some pretty memorable moments for Dr. Jen and her fellow volunteers. In 2014, I was there to open the Restore One primary school. Three hundred kids who hadn’t had a chance to go to school now had that chance. And before they started school, they got adjusted from me. That was very cool. When we took a team of 13 last year, they got to adjust a whole school, and build a hearing impaired classroom. You are part of a medical team, but you do other things as well. It’s an experience that widens your scope. In terms of symptoms and conditions, its very different than what you’d see in Australia. You see things you’d only see in textbooks. It really widens your scope. Some of these villages have never seen a health professional before. It really enhances your strength in terms of diagnosis and referral. It makes you a better chiropractor,” says Dr. Jen. 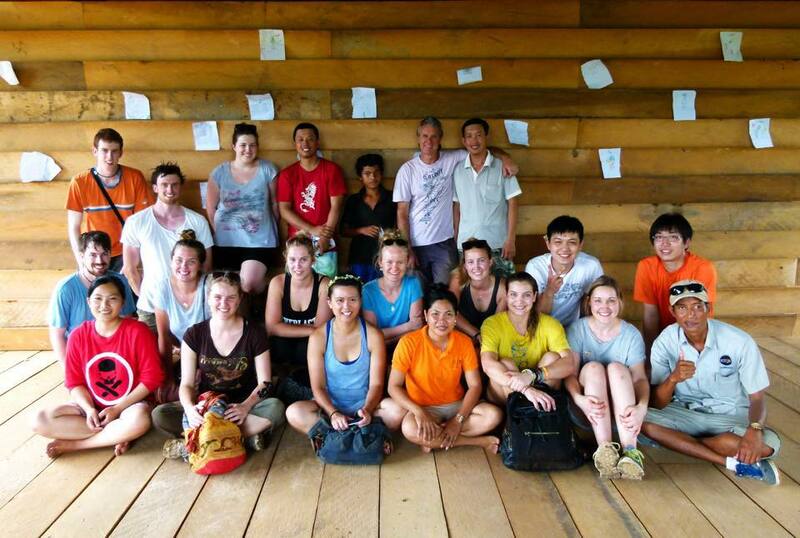 “If you are ever unsure about your value in chiropractic, go on one of these trips. I always say to people, if you are unsure of what we do and need clarification of what we do, come over. Every chiropractor that has come with us, student or professional, has said if ‘I was ever unsure of what I do in clinic or practice, I’m never unsure now.’ It’s something you can’t explain. You just need to come on a trip. Even the referral system is something that reinforces the profound impact of chiropractic in Cambodia. “One village will tell another. You’ll arrive into a new town and have a line up and it wont even be 8am. This August, another missions trip will land in Cambodia. Along with the medical aspects of the trip, volunteers will be building year 7 and year 8 classrooms. This builds on previous efforts that saw the primary school opened in 2014. Now, those students will be able to further their education and nourish their brains. Memorable moments make it an experience worth its weight in gold. It’s almost impossible for Dr. Jen to pick just one memorable moment from chiropractic missions. There have been many over the years. “We do revisit, I often get tapped on the shoulder by kids I haven’t seen in a year, and presented with a bunch of flowers. I’ve got photos of two or three years in a row of these kids growing up. We see malnourished kids one year, and then they’re a little fatter next year. You see them one year with brown hair (which is a sign of malnutrition), and then the next year you come back to jet-black hair. It’s really beautiful. She also recounts an experience when the Governess of the district, a position not unlike a Mayor, travelled with them for three days and got adjusted every day. At the end of that mission, the Governess gave them a memorable video message. “She wasn’t talking about symptomatic pain. She was talking about how she felt relaxed, and how her mind was at ease. She requested that more chiropractors come to love and serve. She asked if they could come for three weeks and serve her community.” Such was her belief in chiropractic and its power to impact her district. Another experience involved “adjusting amongst the cows.” The mobile clinic had been set up in a rural district but it was approaching 4pm. Jen and her team were trying to pack up and beat the monsoon rains. “Then we saw a man hurrying in with his child. We could see the villagers signaling him to run faster.” Dr. Jen recalls how this man handed his child to a volunteer, and through a translator they heard his heartbreaking story. Years previous, this youngster contracted meningitis. Due to a number of factors including distance and finance, they couldn’t get to the hospital early enough. Years on, this child was rigid, unable to see or speak, and communicating only in grunts and cries. He had missed most of his milestones and was physically suffering and in pain. To this end, To Love and Serve receives donations and sponsorships that makes it possible to cover some of the costs. Many clinics get behind their chiropractors missions trip, by donating toothbrushes, undies, soap and other supplies that can help with the health and hygiene classes run on the missions trips. This makes it a community-building experience even back home. Jen’s dream is to build a chiropractic clinic over there, which would be the central point for all of the charity’s chiropractic care. She’d also love to eventually do a mission in Vietnam, in honour of her mother who fled the war in 1981 and arrived as a refugee on Australian shores. “She’s a little ticked off that I haven’t done a mission there yet,” laughs Jen. If you’re interested in a holiday with a difference, and if you’re interested in increasing certainty, then perhaps a chiropractic mission is for you. “It’s about trusting your hands and your heart, loving the person in front of you. It’s such an important message and it really travels far. Just restore one person at a time. If you had any doubts, you don’t come home with any at all. It’s a beautiful message, because every time the team leaves we say “its never a goodbye. It’s a see you soon.” And volunteers almost always do come back soon. The friends you make on a trip tend to be friends for life because you’ve shared something really powerful. Keep up to date on activity with To Love & Serve via their Facebook page.